Click here for the complete brochure! 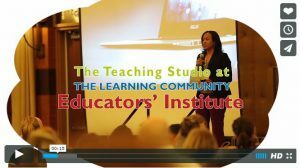 Join us for the 4th Annual Teaching Studio Educators’ Institute! Be inspired by Social Justice & Educational Equity Expert, Dr. Jeff Duncan-Andrade, Associate Professor of Raza Studies and Education at San Francisco State University, and founder of Roses in Concrete Community School. Participate in our workshops led by practitioners from a school recognized for success with a high poverty, predominately English Language Learner student population. This event is generously funded by the Rhode Island Foundation. “I found the entire day to be helpful and enjoyable. All of the keynote speakers gave thoughtful, compelling research-based ‘take-aways’ to discuss further with my colleagues. The day was extremely inspiring.” First Grade Teacher. Click image below for short video of the 2014 Educators’ Institute! Mark you calendar for next year’s event: Friday March 10, 2017! Interested in bringing your message to over 300 educators? Exhibiting or sponsorship are great ways to reach a new network of people and be a part of a new conversation happening in the region. Join us!